My card today is created with my Cricut and Elegant Edges and Flower Shoppe cartridges. The sentiment is SRM Stickers. I based my colors on this card for PDCC101. Also there is a fun challenge on the SRM Stickers blog to create a card with SRM Stickers and upload it to the SRM Stickers Flickr gallery for a chance to win some yummy goodies. Here is a close up of those fab rolled flowers from the Flower Shoppe cart as well as the beautifully scripted sentiment from SRM Stickers. 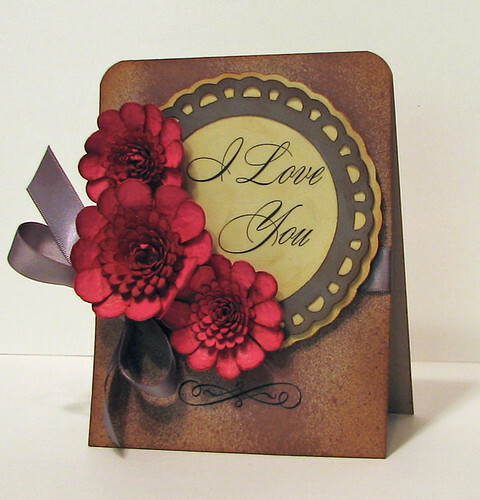 This card was really easy to create.....the Cricut and SRM Stickers really did all the work. So, tell me, are you crafting/card making today?? I hope to get a chance spend some time in my crafting room today. Thanks for stopping by and all of your lovely comments!! Cardstock, ribbon, corner rounder: Stampin' Up! That flower is absolutely gorgeous! I just got this cartridge and haven't really had a chance to play. I can see i will love it! Beautiful card. That card is very beautiful!! I am in love with those flowers!! I was expecting you to list where you got the flowers and then you said you MADE them!!! I've seen some wonderful flowers made from Flower Shoppe, but yours are so beautiful - I love the color and they are so very uniform...Very nicely done and thanks so much for sharing!!! This is so beautiful Amy! The flowers are divine, so rich in color! Oh this is just beautiful!! I ADORE your flowers, they are absolutely fabulous! Thanks so much for playing along with us at The Play Date Cafe this week! This is GORGEOUS! 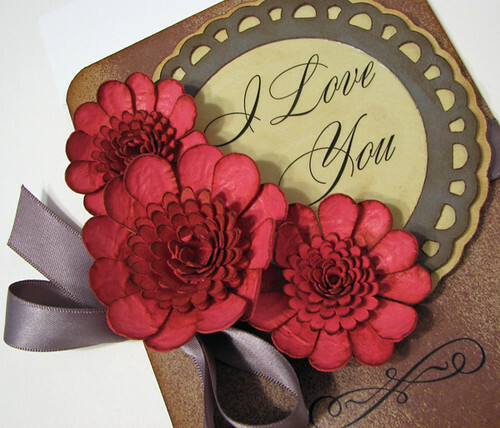 LOVIN' those dimensional, paper flowers! Thanks so much for playing along with us this week at The Play Date Cafe! A gorgeous card Amy,love those rolled flowers they are so realistic! this is just SO gorgeous, amy! your flowers are awesome, and i love your colors! Wow, this makes such a statement! Those flowers are gorgeous, and I love the inked background.